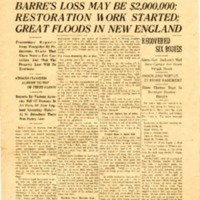 Newspaper with coverage of devastating flood in Barre, Vt. "BARRE'S LOSS MAY BE $2,000,000; RESTORATION WORK STARTED; GREAT FLOODS IN NEW ENGLAND"
Newspaper with coverage of devastating flood in Barre, Vt. "BARRE DEVASTATED BY FLOOD; SEVEN PERSONS BELIEVED LOST; LIEUT.-GOV. JACKSON DEAD"
Map showing high water marks in the city of Montpelier during the 1927 Flood. Bookplate for the "Johnnycake Trail Collection" given to Vermont libraries by Rhode Island citizens after the 1927 floods. "Attention Friends of Vermont." Notice from the Massachusetts Library Club requesting donations of books or money to replace the collections of Vermont public libraries destroyed or damaged in the 1927 Flood. 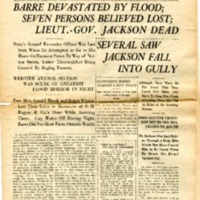 The Montpelier Evening Argus' broadsheet issue containing an account of the 1927 Flood, which details the extent of the damage in Vermont and the actions taken by state government in the aftermath of the disaster, November 15, 1927. 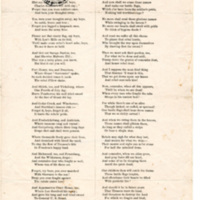 Reprint of Associated Press' account of Governor John E. Weeks' "Vermont Has Come Back" speech, January 22, 1928. Excerpt from President Calvin Coolidge's "Vermont is a state I love" speech at Bennington, Vermont, on September 21, 1928, at the conclusion of his tour of the state to inspect flood damage. President Calvin Coolidge returned to his native state to inspect the flood damage in September 1928. Here he is seen at the back of a train car in Montpelier Junction with Vermont Governor John E. Weeks and their wives.